When you’re shopping for a versatile flooring option that’s just as eye-catching as it is durable, visit MDG Flooring America to browse our extensive collection of luxury vinyl plank flooring in Medina, OH. We are proud to be the area’s most recommended flooring center, and our dedication to unbeatable customer service matches our peerless selection of flooring. With a complete inventory of vinyl floor planks styles from the industry’s foremost brands, we stand apart as the flooring showroom that more locals trust. Find out why more and more homeowners choose cost-effective luxury vinyl by talking to our friendly and knowledgeable store associates. Browse the popular options of luxury vinyl flooring available at our showroom. This state-of-the-art material makes for uniquely beautiful flooring with a pleasant underfoot feeling. Vinyl planks are the fashionable way to cover your floors with sophistication and elegance. For all its visual appeal and toughness, it’s no wonder that vinyl plank flooring is one of the top-selling home upgrades on today’s market. The vinyl flooring we sell duplicates the natural graining and color of real wood without exceeding your interior remodeling budget. Also very popular, our grey vinyl plank flooring creates a comfortable, contemporary atmosphere in home interiors. Our mission is to create an enjoyable customer experience from start to finish. After you have decided which style of vinyl plank best suits your home, we take it from there. We provide professional flooring installation services so you can rest assured that your new flooring is correctly installed for optimized appearance and product lifespan. Start your next home remodeling project today by visiting our showroom for exciting flooring options. We are confident that with our flooring, your home will look great for many years to come. 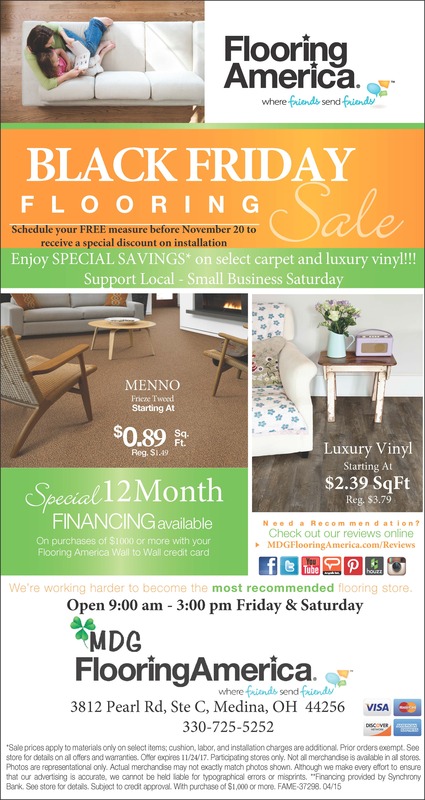 Contact us when you want to upgrade to the cost-effective luxury of vinyl flooring. We proudly serve customers in the Medina, Ohio, area.